“Wow! 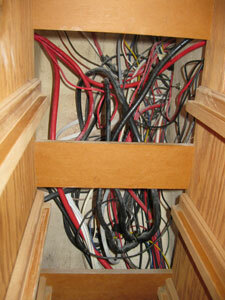 I’ve never seen so many wires on a sailboat.” Thus spoke Alan, the guy who is helping us install all our new gadgets. “Where does this one go, and this one”? Of course, I don’t know. We open panels, crawl around, and tug on wires to find out. Alan buys materials with his contractor discount and lets us use his tools. He gives us directions and advice. With his help we have moved a lot of wires off the battery bank and to the side. 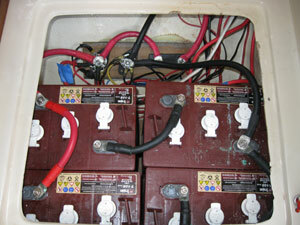 We have almost completed installation of a separate starting battery, a wireless booster antenna, and a power inverter. We are just getting started on the wind generator. There’s more progress. We sanded the bottom of the boat with an orbital sander attached to a vacuum. Then we painted on two coats of bottom paint. We tried not to drip too much. It took over three gallons at $240 per gallon. (The paint is full of cuprous oxide to repel barnacles. It’s really thick and heavy.) The ‘Dyami’ name has been sanded off and ‘Blue Wing’ has been put on. The oil is changed, the stuffing box is repacked with flax, and the zincs are replaced. I was excited today when I finally found the opening for transmission fluid. I had been feeling around under some hoses for it. Turns out it was lurking over on the aft port side in a really tight space. Now all I need is someone with hands the size of bottle caps to get in there and check the dipstick for me. Any volunteers? My parents came down from Charlotte to spend a few days. 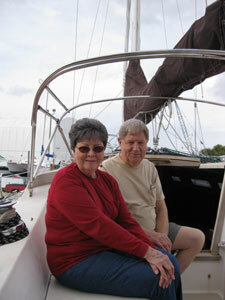 They went out to the boatyard and climbed the ladder to take a first look at the boat. 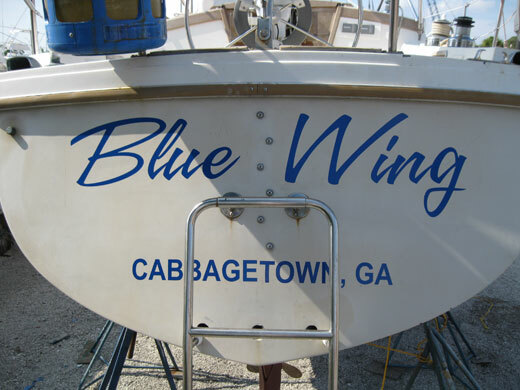 Poor Blue Wing is not at her best. All her compartments are open, and there are tools, half-finished projects, and boatyard dust everywhere. But even with the mess my Mom got an idea of where we’ll be living. She will still worry about us, but she will have a better picture of what she’s worrying about. We have been working pretty steadily, but we did take a small break last Wednesday. Our nice bartender at Finz let me play guitar and uke for our bar tab. There weren’t many people there, but it was fun all the same. I love the zen of tracing cables. I keep waiting for the groundbreaking paper where a mathematician shows how cables can magically intertwine as soon as people stop watching them. Must be topology or something.